WILLIAM was Baptised by Henry Martyn of Arra, aged 7mths 19 days. 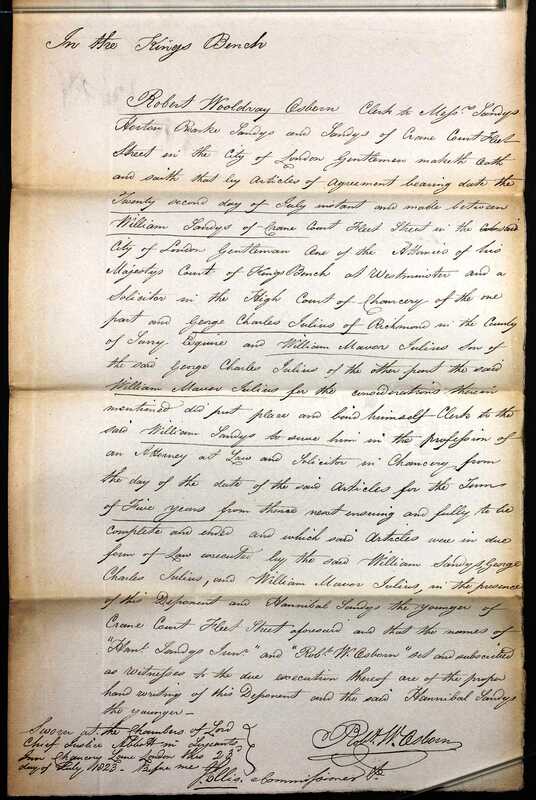 On the 22 Jul 1823 William was contracted by his father to William Sandys of Crane Court Fleet Street in the City of London, gentleman, to serve him as a clerk in the Profession of Attorney at Law and Solicitor in Chancery for 5 years. Signed 23 July 1823. William Maeve Julius, gent, to be Cornet by purchase, vice Terry, who retires. Dated July 9, 1829. Ref: Morning Advertiser 5 August 1829. 13 Regiment of [Light] Dragoons. 2nd Lieut. [Cornet] 9 July 1829. Cornet 13th Dragoons 9 Jul 1829 by purchase. Lieut " " 18 Apr 1834 " "
Capt " half pay 4 Sep 1840 " "
Service abroad 1830 5 Jul to 1838 23 Feb Madras. J F Patterson Lt Col Commanding Officer. B McMahon Lt & Acting Adj. War Office September 8, 1840. Ref: Morning Advertiser 9 September 1840. War Office, Pall Mall, July 27. To be Captains, without purchase. Captain William Mavor Julius, from half pay 13th Light Dragoons. William was invalided out of the Army with the rank of Major. Lived at Lincolnshire, then Devon, with his father GEORGE at Richmond in the 1841 Census, a Captain aged 30 yrs. later at Farnham Rd. Tilford with his niece Julia Henrietta Quilter (1861 Census) Also lived for some years in Black Lake Cottage Tilford nr Farnham Surrey. In 1900 Black Lake Cottage was bought by the wife of Sir J.M. Barrie. Black Lake was used by Sir J.M.Barrie as the centre of "Never Never Land" in his book "Peter Pan". He used Black Lake Cottage [now Lobswood Manor] as his country home from 1900-1909. The house was almost entirely surrounded by pine forrest, with only a dusty winding road to connect it to the outside world. On the far side of the road lay the Black Lake, hidden among the pines, while beyond it rose the crumbling ruins of Waverly Abbey. [There are other references to Black Lake Cottage in the book and some reproductions of snapshots of the garden and lake]. Black Lake Cottage was given as the address of Major William Mavor Julius at the time of his death 18th May 1876, however he died at his niece's home in Farnham Rd. Tilford. There is a Memorial at Tilford Church, Surrey for Major William Mavor Julius d 18 May 1876. Julius. May 18, at Tilford, Major W.M. Julius, formally 13th Light Dragoons, aged 69. 2. Census: England, 8 Apr 1861, Farnham Road Farnham. William is recorded as head of house aged 54 unmarried retired Army Major a British Subject born Middlesex England. Also in the house was his neice Julia H Quilter and a servant. 4. William Mavor Julius: Will, 7 Oct 1865. 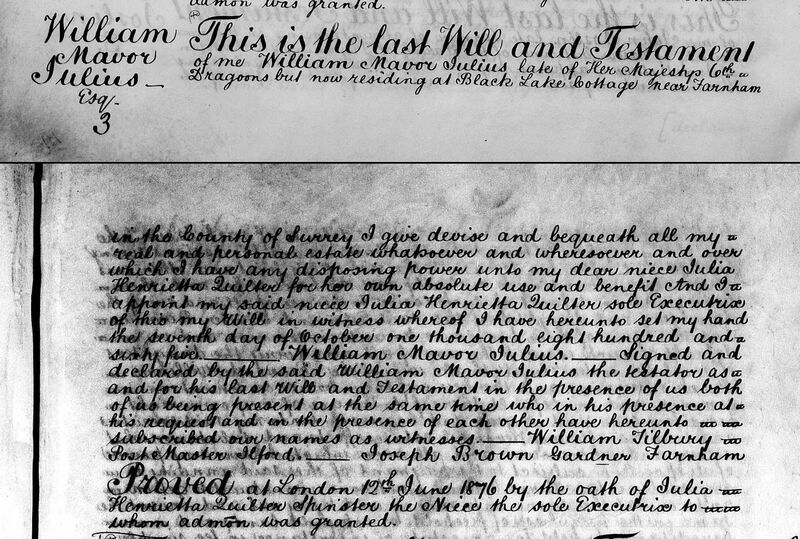 The Will of William Mavor Julius Esq formerly of H.M. 6th Dragoons but late of Black Lake Cottage nr Farnham in the county of SRY who died 18 May 1876 at Black lake Cottage was proved 12 Jun 1876 by Julia Henrietta Quilter of Black lake Cottage spinster neice and sole Executor. Effects under L12,000. Resworn July 1876 at under L8000.